Shop smart, shop Fright-Rags for exclusive Evil Dead merchandise! Joining the company's already impressive collection of Evil Dead trilogy apparel is a new enamel pin, two pairs of socks, and two pairs of lounge pants. Fright-Rags worked with Evil Dead franchise effects artist Tom Sullivan to design the Necronomicon enamel pin. It folds open to reveal Sullivan's original artwork within, just like the real Book of the Dead. Custom-knit socks feature the classic Evil Dead 2 skull artwork or the S-Mart logo. 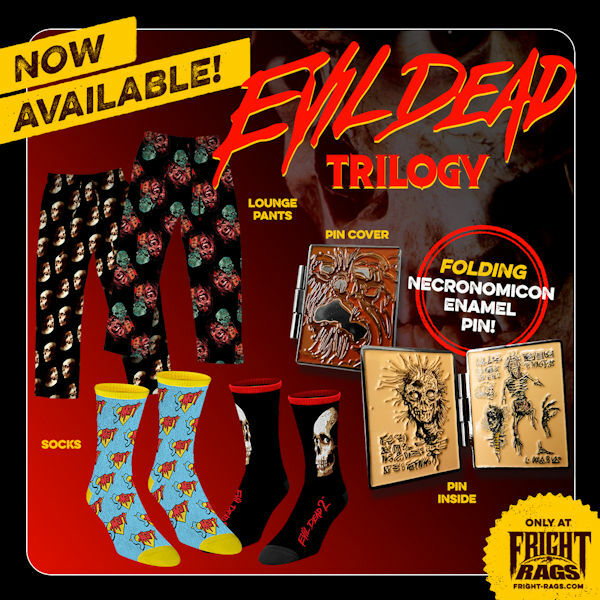 Lounge pants are available in two styles: one featuring a collage of Evil Dead 2 imagery and another with the Evil Dead 2 skull. These ultra-comfy pants feature pockets and come in S-XL but are stretchy to fit all shapes and sizes. Just in time for the holidays, Fright-Rags has new Silent Night, Deadly Night apparel. Joel Robinson's vibrant artwork - as featured on Scream Factory's new Blu-ray edition of the film - is available on T-shirts, baseball tees, and hoodies, in addition to a reprint of a classic design by Justin Osbourn. Stock is running low on these items. In celebration of the release of Another WolfCop, Fright-Rags has created two WolfCop shirts. Designed by Coki Greenway and Nathan Thomas Milliner, these tees will make you believe that you're half man, half wolf, all cop. 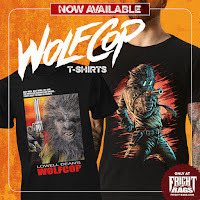 Merchandise from the Evil Dead trilogy, Silent Night Deadly Night, and WolfCop is on sale now at Fright-Rags.com. Domestic orders (US) placed by December 17 are guaranteed to arrive in time for Christmas.